A fast-paced police procedural with the most original main character I’ve come across in years. “How do you identify a ruthless killer when you can’t even recognise your own face in a mirror? Returning to work following an accident, Detective Inspector Ray Patrick refuses to disclose he now lives with face blindness – an inability to recognise faces. As Ray deceives his team he is pulled into a police operation that targets an international trade in human organs. And when he attempts to bring the organisation down, Ray is witness to a savage murder. But it’s a killer he will never remember. The pressure mounts as Ray attempts to keep his secret and solve the case alone. With only his ex-wife as a confidant, he feels progressively isolated. For a long time I’ve been fascinated by a team of people employed by the Metropolitan Police as “Super Recognisers”. They have the ability to recognise any face they have seen before even from the smallest detail or feature. Ray Patrick’s accident has left him right at the other end of the spectrum, suffering from prosopagnosia or face blindness. His struggles with the condition that makes doing his job virtually impossible form the background to an exciting crime thriller that kept my attention throughout. In creating the character of Ray the author has shown the skills previously exhibited in the excellent DI Hannah Robbins series – showing the human side of the various police officers involved in the story. As a veteran crime fiction fan my favourite authors are the ones who know how to do this and how to make me care at least as much about the characters as the plot and the outcome of the story. Another thing that shone through in Dead Blind was how much effort the author has put into research. Always a reliable expert regarding police procedures, ex-police officer Rebecca Bradley has tapped into other sources this time, adding to the authenticity for the reader. 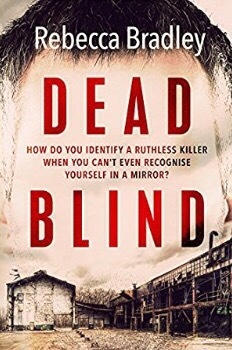 I highly recommend Dead Blind to all crime fiction fans. Thank you to the author for the early reader copy.